First off, if you're an English speaker, every story proffered on the Russia-Georgia conflict is 100-proof propaganda. Next, the most important story you haven't heard is that Israel is betting against US success vs. Russia. Paradoxically, and despite Israel's typically overweening, convoluted conceits, this is very heartening, since it means they think the US won't go to the mat and start launching its nuclear arsenal. Apparently, they also believe the Russians can handle US Navy, Air Force, and Army units going into Project Georgia in the names of "humanitarian aid" and "peacekeeping." Israel understandably wants the output of the BP-sponsored Baku-Tbilisi-Ceyhan whoever controls it, yet until now they've been neck-deep in arming and training the Georgian military. How deep? Georgia's minister of defense, for example, is a citizen of Israel. Still, it's tough to be sanguine, or resist going into seizures or duck-n-cover positions. The Bush Administration is about as dangerous as a badger on crystal meth, and as we've repeatedly seen, they're so dumb they can screw up a soda straw. If they send military personnel into a war zone, as they announced their intentions today, I don't see how some of them won't get zapped. While the Russians have already achieved their negotiating objectives vs. NATO-BushCo, it will be next to impossible for them to restrain the itchy trigger fingers of individual, low-level units flush with easy victories. I'd love to be the bearer of good tidings, I'd love to regale with tales about how Water Engines, sunny pyrolysis and wave energy will save the earth and our asses, and that we'll all sing Joni Mitchell songs in harmony. Ice cream castles in the air, feather canyons everywhere, yep. Unfortunately, this is probably the closest we've been to nuclear conflagration since the Cuban Missile Crisis. This isn't pessimism, just a cold-around-the-heart look at the factors. On the happy side, having the Israelis bail out on arms sales to the Georgians, renouncing their military sponsorship and offering a no-confidence vote on the Bushies, well, that's a reason to not pack up the fam right now and head to Saskatchewan. If Israel is packing up to leave the the tattered hulk of America's security umbrella, much of which they've built, pay condo fees on, and effectively control, it's a high decibel, panic-button message. A top Georgian envoy in Israel on Sunday urged the Jewish state to use whatever leverage it has to put pressure on Russia to pull its forces out of the small Caucasus nation. But while voicing support for Georgian territorial integrity, Israel decided instead to appease Russia by halting all arms sales to Tbilisi. Israel has sold some $500 million worth of military equipment to Georgia over the past few years, and top Israeli military experts have been involved in training Georgian armed forces. Israeli soldiers who participated in training Georgian forces as recently as four months ago told Ha'aretz that they were not surprised when hostilities broke out. "There was an atmosphere of war about to break out. ...From my point of view, the battles of the past few days were to be expected," said one soldier. As Russian forces invaded Georgia late last week and the two nations engaged in what is increasingly being called a full-scale war, Israel's leadership expressed concerns that Moscow could retaliate for continued Israeli military support of Georgia by selling advanced arms to Iran and Syria. Defense officials cited by The Jerusalem Post later said that arms sales to Georgia had ceased several months back, after Israeli authorities became alarmed by urgent requests for large supplies of weapons by Georgian authorities apparently aware that they were about to go to war with Russia. Said one Israeli official, "We have good relations with [Russia and Georgia], and don't want to back either in this conflict. We therefore made a decision to drastically minimize sales of weapons to Georgia." Many Israelis expressed frustration with what they said amounted to abandoning Israel's allies in Georgia to appease Russia, even though advanced Russian weapons have been reaching Iran, Syria and their terrorist proxy Hizballah for years. Israel is home to some 80,000 Georgian Jews who would also like to see Jerusalem provide outright backing to the small Christian nation. Georgia's other major military backer, the United States, has said it will continue to provide support and training to the Georgian army, and warned Russia that its military escalations could severely damage relations between Moscow and Washington. when you're cheering me up I know there's real trouble. I promise not to post George Orwell's Ten Most Depressing Quotes the next couple days. Otter: We gotta take these bastards. Now we could do it with conventional weapons that could take years and cost millions of lives. No, I think we have to go all out. I think that this situation absolutely requires a really futile and stupid gesture be done on somebody's part. Seems slightly strange, surreal perhaps. Condoleeza Rice telling another nation to not invade or consider regime change. Nobody over on this side of the Equator speack SplangEuroAmerish. Images on the tv screen are interesting. Canadians are calling the spade a shovel this time: Oil feud! yeah, I read through the whole list of imdb Animal House quotes. Ready to weld armor plates on the bro's car and crash the parade? 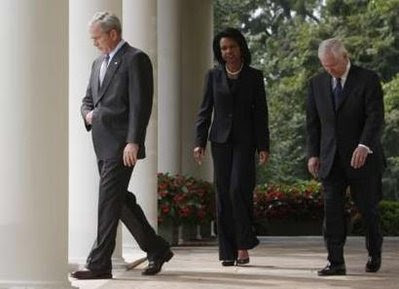 yeah, maybe Condi has a little issue with hypocrisy. More importantly, however, her fashion sense is awesome. Re: my country's evolving language: Dude, I are super-impressed. given the blackout we have on communist Canadian news, I have not seen the anti-democratic propaganda you speak of. Do you have a pointer to one? I must admit my ignorance about the Zionist controlled National Post and Globe and Mail, and CBC and CTV. Good stuff get across on CBC radio 1. Thanks, Naj, listening to the link to "As it Happens," and their interview of the great Michael Klare (author of "Blood and Oil") right now.